I have been neglecting my French Fridays lately. Well, that is not exactly true. I have still been preparing the recipes from Around My French Table, I just haven't been writing about them. I started a new job, you see, and my time in the kitchen has been unfortunately limited. 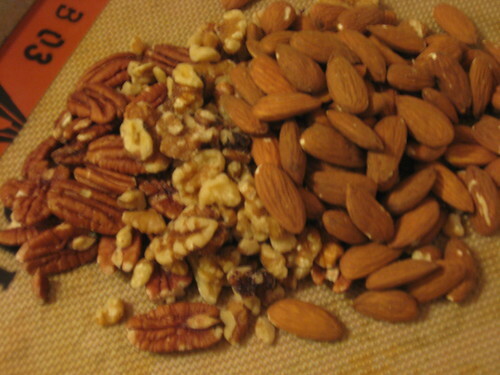 I do plan to post a belated review of the semolina cake that I threw together on one of my days off, and next week I will wax rhapsodic about the beef daube that I made today, but tonight I am going to talk about the sweet and spicy cocktail nuts that I made last week. It wasn't until Friday afternoon that I remembered that I was supposed to make something for FFwD. Since I couldn't stand the thought of hoofing it to the grocery store after work, I decided to make something with ingredients that I had on hand. I had some leftover egg whites and a variety of nuts in the freezer, so I decided to throw these cocktail nuts together. 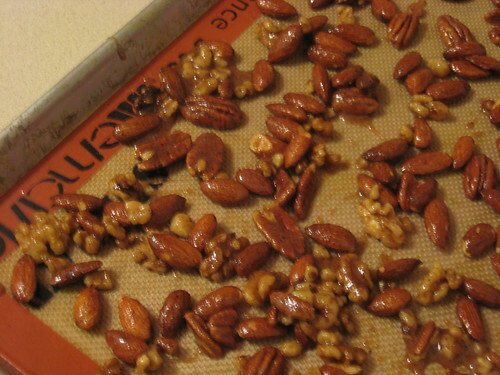 These nuts were quite quick and easy to make - until the part where Dorie tells us to lift one nut at a time out of the coating mix, shake off the excess, and place it on a sheet tray. I did that about 10 times, then I started grabbing handfuls and throwing them on the pan. Despite my laziness aversion to fussiness, these nuts were very good. Perhaps my coating was a bit thicker and I had to break apart the baked nuts a little more (especially after I forgot to do this before they cooled completely), but the flavor was still solid. I enjoyed the mix of salty and sweet with a touch of spice. 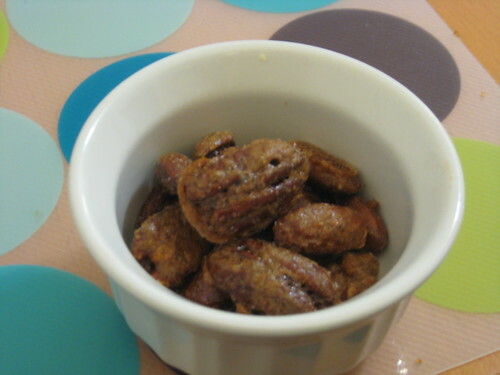 When I make these again I will probably add a bit more cayenne, or maybe, as Dorie suggests in her "Bonne Idee" sidebar, swap in curry or Chinese five spice (which I love but rarely use). These make a great cocktail snack or an interesting alternative to dessert, and I look forward to giving them my own spin. Next time I might even take the time to give each nut some personal attention. Well, I think we all know that isn't going to happen. For this recipe, and hundreds more, pick up a copy of Dorie Greenspan's Around My French Table. Also, to check out the Dorie-inspired culinary adventures of other bloggers (or to cook along with us!) click here.